Betty was born May 19, 1921 in Kansas City, Missouri. Her parents were Melville and Louie Cave. Betty graduated from Topeka High School in 1939. She graduated from the University of Kansas with a BA degree in English. At KU, she was a member of Alpha Chi Omega Sorority and received her 75th anniversary pin from this organization a few years ago. Betty married Harold E. Van Slyck on January 13, 1945, in Alexandria, Virginia. They were mostly life-long residents of Topeka. Harold preceded her in death in 1984 after nearly 40 years of marriage. 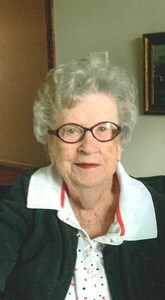 Throughout her life Betty was active in many organizations, including Alpha Chi Omega Sustainers, P.E.O., and the Junior League of Topeka, in which she served as president. She volunteered with countless organizations, including the Gage School P.T.A., Boys and Girl Scouts, and The Topeka Public Library. She and her husband were charter members of what is now Western Hills Golf Club, and they were thrilled to live by the 14th hole. Besides golf, Betty also enjoyed bridge, crossword puzzles, sewing, crafts, and their supper club. Betty was a loving mother to Hal Van Slyck (Brenda) of Jefferson City, Missouri; Cindy Pettyjohn (Bill) of Topeka; and Joyce Smith (Greg) of Lowman, Idaho. She had six grandchildren: Melissa, Nick, Nathan, Joe, Robin and Deanna. She also had four great-grandchildren: Seeley, Myles, Calder, and Castin. Betty was also preceded in death by her brother, Bill Cave. Funeral services will be held at 11:00 a.m. on Friday, December 7, 2018 at Mount Hope Cemetery Funeral Chapel. The family will receive friends one hour prior to the service. Memorial contributions may be made to the Topeka High School Historical Society, in care of Joan Barker, 800 SW 10th, Topeka, Kansas 66612. Dove Southwest Chapel is assisting with arrangements. To leave a special message for the family online, click the Share Memories button above. Add your memories to the guest book of Betty Van Slyck.